Amaravati, March 19: Jumping into the electoral battle for the first time, Telugu film star and Jana Sena founder Pawan Kalyan will contest the April 11 Assembly election in Andhra Pradesh from Gajuwaka and Bhimavaram constituencies. After an intensive survey in various constituencies, the party general body chose these seats for Kalyan and he has agreed to contest from there,a Jana Sena release said Tuesday. 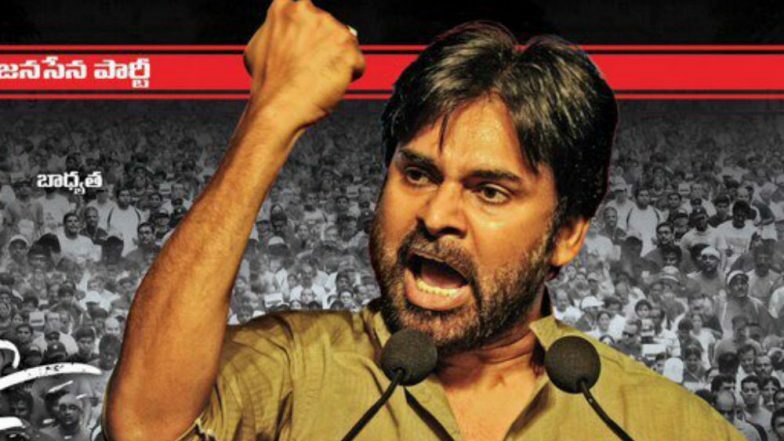 Jana Sena entered into an electoral alliance with the Bahujan Samaj Party, CPI and CPI(M) for the April 11 Lok Sabha and Assembly elections in the state. Under the alliance, Jana Sena will contest 140 Assembly and 18 Lok Sabha seats. Lok Sabha Elections 2019: Pawan Kalyan's Jana Sena Party Releases List of 32 Candidates for Andhra Pradesh. The party so far announced its candidates for 77 Assembly and nine parliamentary seats. The BSP will field candidates in three Lok Sabha and 21 seats while the two Left parties will contest seven Assembly and two Lok Sabha seats each.